ETRC 2014 (European Radiosport Team Championship), the youth version of WRTC 2014, was held in Virrat, Finland one week after the Boston WRTC event with 15 three-person youth teams seated in one room in front of their computers and connected to the global Amateur Radio simulator over the internet, all in Virtual Reality. Once again, the latest technology was utilized in Amateur Radio for the benefit of Amateur Radio’s future and by Amateur Radio operators themselves. In total, ERTC 2014 activated hundreds of young people and licensed radio amateurs in full harmony within the participating 44 countries. ERTC 2014 was a huge success bringing youth and seasoned hams together around the same fireworks in the spirit of international Amateur Radio. But Mother Nature added to the excitement as a thunderstorm knocked off electricity in the area and power was restored only 5 minutes prior to the start of the contest. It was a Le Mans type of hectic start leaving many teams in the starting grid. The Head Judge, Hans, PB2T, President of IARU Region 1, ruled the first 22 minutes out to give a level playing field to those slow in booting their contest machines and putting their racing helmets on. As Silver and Bronze teams were less than three multipliers apart, the fact that the S/W platform (HamSphere 3.0) used in the contest logged all QSOs into the system, gave the organizers full confidence in verifying each station and their exchange. Only seven (7) multiplier uniques were found in the database and they did not affect the final rankings. *W100AW was activated by Martti Laine, OH2BH as part of the ARRL Centennial celebrations in Hartford, Connecticut. Thanks (K1ZZ) and congratulations to the American Radio Relay League. ERTC 2014 was part of a European wide youth gathering known as Youngsters On The Air (YOTA) which is held every year in different European Union countries under EU and International Amateur Radio Union (IARU) sponsorship with the aim of bringing youth together in the spirit of cultural exchange and learning from one another in all segments of Amateur Radio, science and electronics. This year fifteen EU countries were represented. ERTC also brought young people together globally over the internet, using Amateur Radio simulation software on a shared platform – all in the natural hangout of today’s youth. HS is an Amateur Radio (AR) simulation software package giving a hands-on opportunity to youngsters who wish to experience AR in its natural setting while still busy with their studies and not able to take a ham exam or to invest in actual AR equipment. HS coexists with real AR with true propagation science, QSL collection and a variety of contest formats and related equipment. It offers an experience which will encourage young people to study for a ham license and thus enter our wonderful world of Amateur Radio. The latest breakthrough in the simulation software features real-time propagation and system integrated logging, instant QSLing and awards. The ERTC 2014 event was honored to have Professor Rumen Gechev, LZ1MS of WRTC 1990 fame as patron of this first-ever Amateur Radio-like WRTC simulation over the internet. Rumen himself finished 4th in 1990 in the first WRTC held in Seattle, WA. He has subsequently proceeded with life with a highly impressive career as Bulgarian Deputy Prime Minister and currently as Professor in Economics and Sustained Development at the University of National and Word Economy in Sofia, Bulgaria, adding to his Visiting Professor duties at many leading universities. Rumen has not lost interest in Amateur Radio and he was active during ERTC 2014 giving an LZ multiplier to many participating youth teams – including his own Team Bulgaria. Hans, PB2T; Kristjan, ES7GM; Marcin, 161HS363 (Poland); Juha, OH9MM; Kim, OH6KZP; Kelly, 5B4AIT and Martti, OH2BH. Today we started with some very active energizing games from LY and PA, after that the LZ team with the help of some OH radioamateurs gave a short introduction on ARDF and the use of a 80 meter ARDF handheld direction finder. The group was split in three, one started with the ARDF foxhunt, build a slim-jim antenna and morsecode sounder. In the afternoon after the lunch the groups changed activities. In the evening after dinner we had a nice presentation from Marko OH8WM about R.Net the linking of repeaters in Finland. Some repeaters are linked by internet and some by 2.4 GHz link transceivers. The presentation showed how the network is build up and that the repeaters have to be build up from professional grade equipment to be allowed to share sites with other telecoms equipment. Marko showed some pictures of the network lay-out and repeater locations. Most repeaters are build up using old, but still high grade and standard PMR surplus. Then it was free- or sauna time and we made a lot of eye-ball QSO’ s.
We started the day with a lovely breakfast in the restaurant and after that we had a nice energizing game. It was about remembering the names of other people and that turned out to be harder then most thought, especially when you have more then 8 names to remember. After that nice game we continued where given name tags from other participants and find them in the crowd and receive a key-cord and nametag-holder. The group moved then to the gym and we got some presentations. The first was from Lisa PA2LS, Tommy ON3TD and Mattias SE0M about the YOTA-december activity, the award and changes in the YOTA website. Then Johan SM5F gave use a presentation about the contest WPX activities at SH3Y and SK3W in 2012 and 2013 in Sweden, where a young team of YOTA operators smashed the SM-records to pieces. Next presentation was from Jani OH6BG about the webversion of the VOACAP software. In a presentation of about an hour we learned a lot about propagation, but most important how to use this tool for example planning a contest and award hunting. Then the station manager Vili OH5GE gave us the do and don’t of the OH2YOTA station and antenna set-up. After the morning program we went for the restaurant again for a nice warm meal and enjoy about 2 hours of free time before the start of the afternoon program. The afternoon program was done by the teams of Romania and Finland and had some nice energizing games and tasks. After that we made 7 groups that talked and discussed about the values of the key components in the youth pass. After the discussion everybody gave the results of there discussion and for some it was a bit scary to for the first time in there live present yourself to a big group of people in the English language. After again good dinner, the teams started to build up the international evening where teams can show the best food and drinks from there country. Some had so much food, snacks and candy they could skip the morning breakfast! 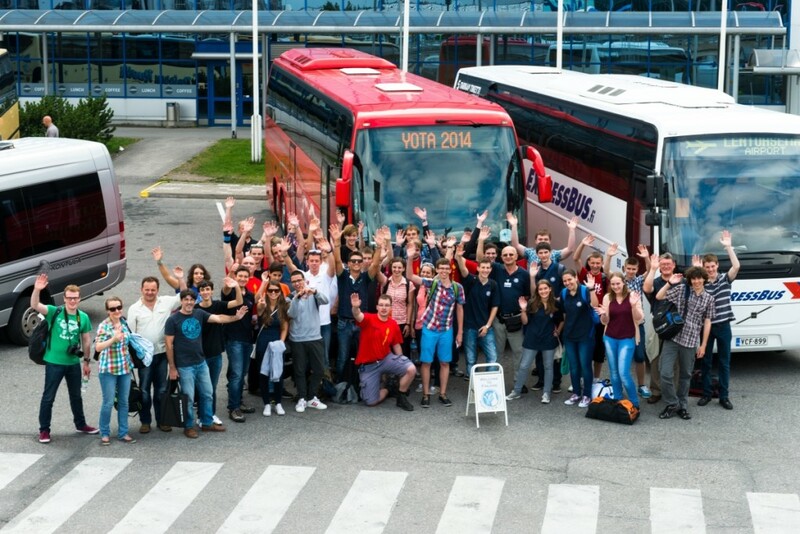 YOTA 2014 – Start of the youth exchange! Start of the youth exchange! The arrival of the teams starts after 13:00 hours, when one participant from PA and the SM team arrive. At the same time team Finland is working very hard to build up the OH2YOTA station, get all there stuff out of the cars and make lot’s of phone calls to arrange many things and make sure everybody get’s on the bus from Helsinki airport. In the late afternoon the bus with 90% of the teams left Helsinki airport for there trip to Virrat. In two groups the teams enjoyed a lovely pizza dinner at the restaurant. When the first team had just finished there meal, the bus with most countries arrives. At that time the weather changed and it starts to rain quite heavy, just when everybody wants to get off the bus. Mari and Kati do there best, to give everybody there keys as quick as possible, so everybody could check in there room. But due to the rain the list of rooms and participants got wet and it took longer and longer, but finally everybody had there rooms! At around 21 hours we had a nice first meeting with all the teams and we got some explanation of the OH-team about some rules and the program for the evening. After that we made a short tour around the site and enjoyed a evening of meeting old friends and making LOT’s of new international friends, most went to bed when the new day started. Almost all of the teams have now joined forces at the airport and are heading towards Virrat. 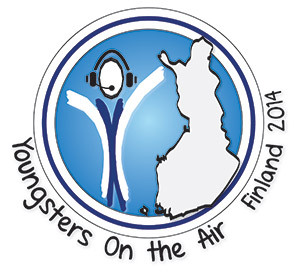 During the summer of 2014, a youth exchange “Youngsters on the Air” will be held in Finland, organized by the Finnish Radio Amateur League. During this week teams of young radio amateurs from 15 different European countries will be participating during different activities: presentations, competitions, visiting radio stations, workshops, ARDF etc… As three previous events in Romania, Belgium/Netherlands and Estonia have shown, for the young HAM’s it will be a great experience they will never forget. Participants: 15 teams from different European member associations of IARU R1. A team consists of a team leader, who could be an older person over 18, and 4 team members between 15-25 years old. Location: Virrat, Finland. Click here to view on the map. Fees: part of travel costs (calculated with a distance calculator by the European Commission), plus participation fee 50€/person. All other costs (accomodation, food, activities) will be covered by the Erasmus+ programme of the European Commission. If your member society is interested to participate, please respond by 31st January 2014, as the full application should be ready for 15.03.2014. For questions and where to send the application, download the invitation document. It was decided towards the end of YOTA 2013 that YOTA 2014 was to be held in Finland. The YOTA flag was lowered on the final evening and presented to Kati and the Finnish team who will proudly display it next year.